After seeing this new image from the NASA - Dawn Spacecraft, Astronomers and Planetary Scientists are puzzled over a (for now, still kind of) mysterious and large Circular Suface Feature located South of the Equator of the Dwarf Planet 1-Ceres, and slightly to the right (Dx) of center in this view. This Basin, nearly 186 miles (such as a little less than 300 Km) across, is not as deep as it would be expected for an Impact Crater, (and this is what makes it, in a way, "mysterious") and appears to contain low-relief Mounds. 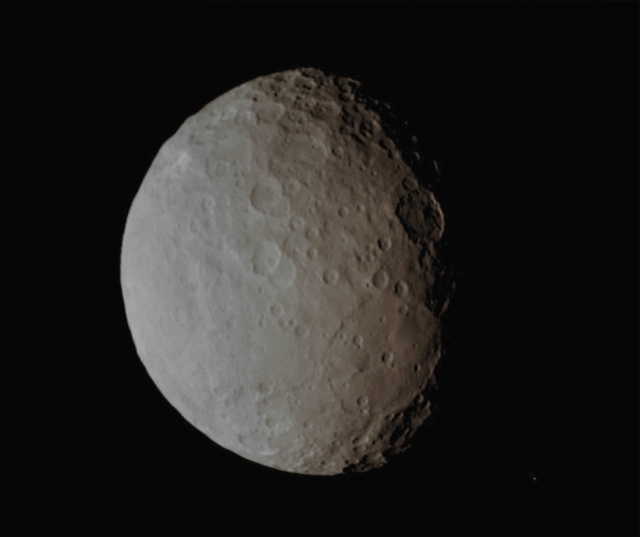 This image was taken by the NASA - Dawn Spacecraft on February, 19, 2015 from a distance of nearly 29.000 miles (such as approx. 46.670,86 Km) from 1-Ceres. This image (which is an Original NASA - Dawn Spacecraft's b/w and NON Map-Projected frame published on the NASA - Planetary Photojournal with the ID n. PIA 18925) has been additionally processed, magnified to aid the visibility of the details, contrast enhanced and sharpened, Gamma corrected and then colorized (according to an educated guess carried out by Dr Paolo C. Fienga-LXTT-IPF) in Absolute Natural Colors (such as the colors that a normal human eye would actually perceive if someone were onboard the NASA - Dawn Spacecraft and then looked down, towards the Surface of 1-Ceres), by using an original technique created - and, in time, dramatically improved - by the Lunar Explorer Italia Team.